Japanese Swordsmithing must be one of the most amazing Japanese cultural experience in Japan. 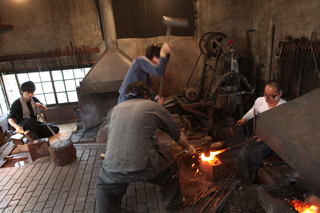 There is one of the most famous and much skilled swordsmith in Takasago, Katsushika-ku, Tokyo. 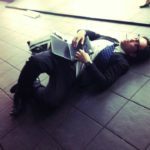 Japanize organizer Satoshi has visited this place, so reports the experience and share the event information to visit this place. First of all, I have heard his long time experience and how Japanese Swordsmithing is really precious. The reason why Japanese Swordsmithing is precious and different is its method called “tatara iron making method” to make the iron which is the source of the sword. Nowadays usually the irons are made by melting the iron ore and solidify them, but this “tatara iron making method” is the way to hit the iron ore, bend and make the layers. Because of this difference of making, the surface of each the Japanese swords looks more natural and unique. We Japanese people would call it “Aji ga aru” meaning like more unique. This Japanese Swordsmitexing experience was really interesting and exciting! 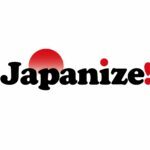 Therefore Japanize will organize the event to visit there, hear the stories from craftsman Yoshindo Yoshihara and visit the workplace with up to 10 people on July 17th 2014. Of course you will be able to see and maybe set up the sword in your hand! Please check the details on the below event page. Looking forward to visiting and having the great experience with you! * And I have also visited Shibamata of the historical town after swordsmithing visit. It was very traditional and beautiful place, seems like little Asakusa. Let’s visit there and walk around if you are also interested!